What happens when you have an unending lust for stamping mixed with a desire to layer stamps to maximum effect? Only pretty things darlings! As I mentioned before I just got in my order of the Shany 2012 stamping plates and boy was I ready to play. I was going for light fluffy and pretty with a hint of shimmer yumminess. 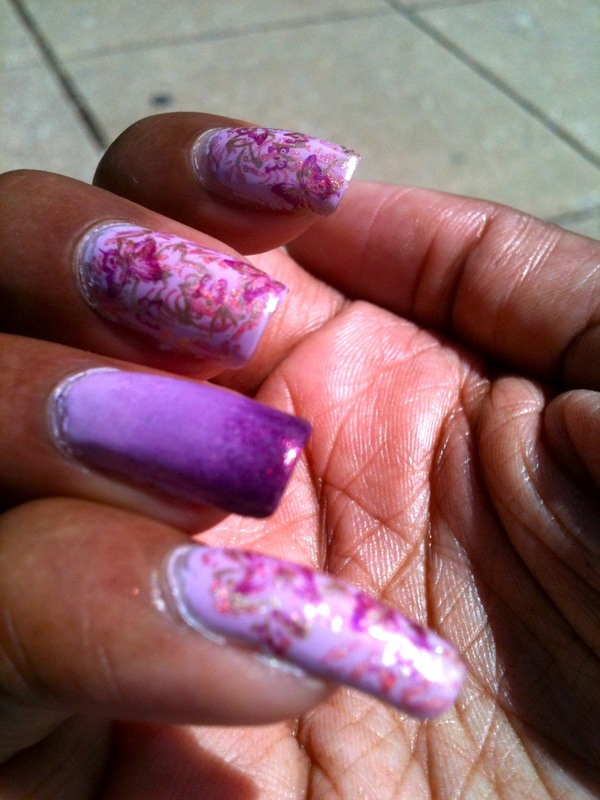 I used Funky Fingers Sugar Plum Fairy as the base. This polish is a pale lavendar color with light blue undertones and a golden shimmer. It's beautiful but like the FF polish before required thinning and two coats to reach opacity. 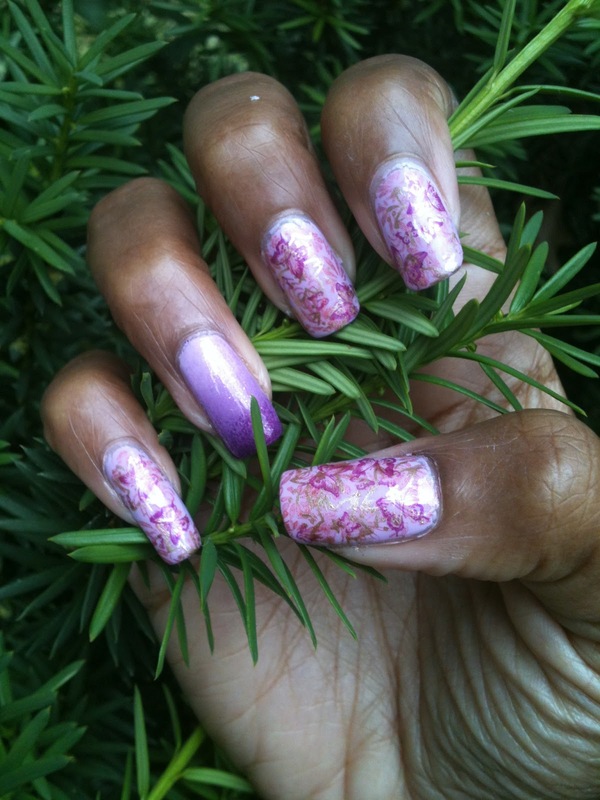 I stamped first with China Glaze TTYL using SH20 floral pattern. I then stamped over that with CG Passion using plate SH13. 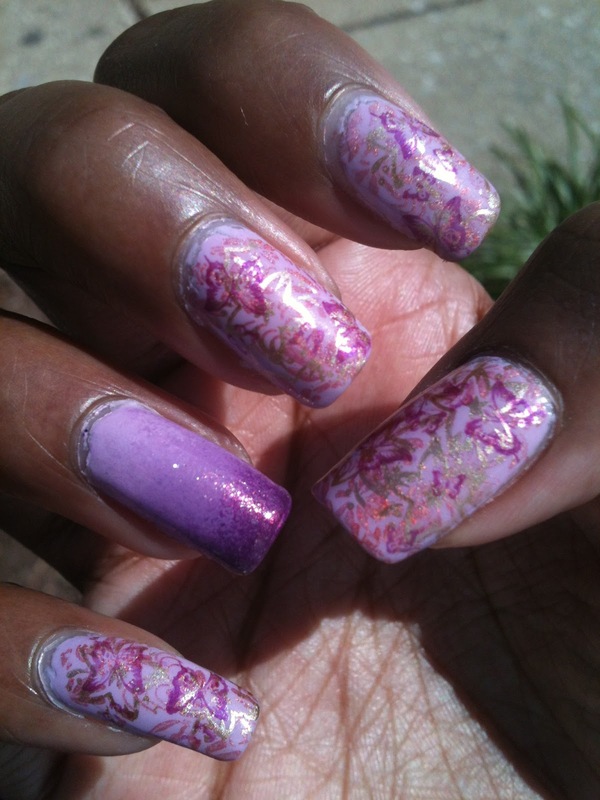 Finally I added butterflies using Dashica's Shimmer Purple stamping polish using plate CH3. For the accent nail I did a simple gradient using Sugar Plum Fairy as the base and Orly's Close Your Eyes. 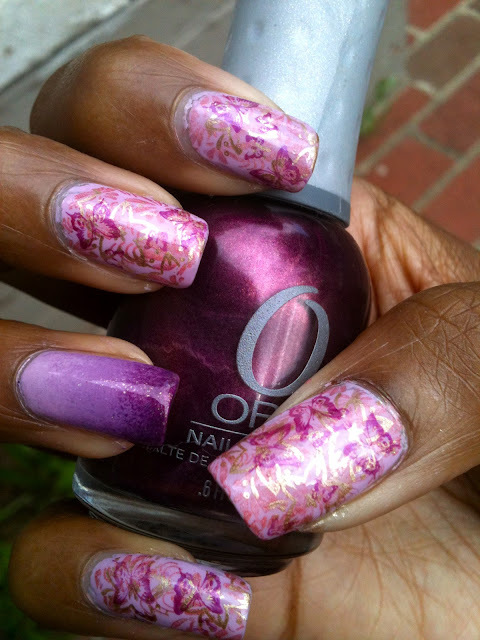 CYE's is a gorgeous deep plum colored polish with paler purple and gold shimmer throughout. I finally put a simple coat of CND Gold Sparkle over it and abracadabra I had my pretty layered mani! I used a new method for my gradient nail this time which made the transition between colors look a lot smoother. I love the contrast of fresh green with lavender sort of like flowers peeking out of greenery . Love the flashes of gold from cG Passion! You can really see the holo jump out on this one. What do you ladies think - very feminine right? What I like the most is that the Shany plates have so many freaking cute designs! These plates, like the Bundle Monster one's, really give you a big bang for your buck for about $12 you get well over 100 images. Honestly, I love stamping enough to find this quite a good deal. If you're interested in the plates check you can find them here on Amazon.com. They are also eligible for super saver shipping, yay, so you can grab a couple things and get it shipped on the cheap! Thanks for reading and stay tuned for a massive indie polish haul. My clicking finger got trigger happy in a major way when I spotted some of these little babies! Toodles.